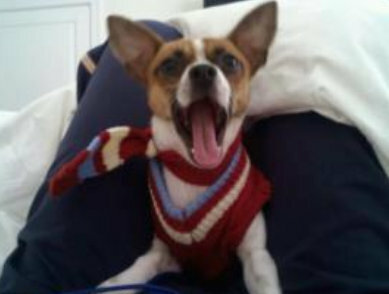 A photo of the victim’s dog, Skeeter, from a posting on Craigslist. 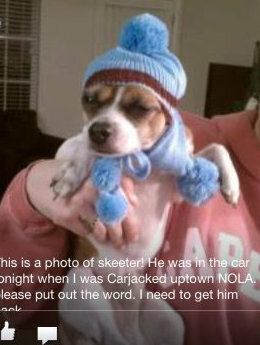 A carjacker just off South Claiborne in the central Carrollton area hit a victim who was trying to get away from him and then took her SUV with her dog still inside Tuesday night, police said. The victim was getting into her car in the 2300 block of Burdette around 10:30 p.m. when a stranger on a bicycle rode up and forced her car door open, implying that he had a gun, according to initial reports. She tried to close the door, but he hit her in the face and forced her out of the vehicle, a tan 2000 Lincoln Navigator, the reports state. He then got in the Navigator and drove off on South Claiborne toward Broadway Street, with her dog still inside the SUV, according to the reports. Anyone with information is urged to call the NOPD Second District at 658-6020. 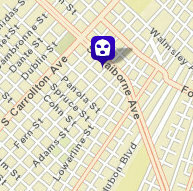 Don’t worry NOPD officers from other districts were checking for underage drinking again at bars on Maple and the boot. I am glad Susan Guidry is using these overtime police officers to check 18-20yrs old college kids. Please call her at 504 658 1010 or email her sgguidry@nola.gov and ask her why? you will never get a response. Please ask her why we waste overtime, on out of town college students, who plead guilty and have to donate blood instead of paying the fine. Why doesen’t she have these police officers working the hot spots of her district.? The reason why this carjacker did what he did was because his father, a drunk, who probably got started as a underage drinker, could not keep a job And because his father was too was drunk and didn’t show up for work. Hence, this father abandoned his kid who became a carjacker cause his alcoholic father wasn’t around. Is any wonder why New Orleans can’t get anything done for the last 50 years and is still the poorest city in the nation?…. And you clueless down voters, why not try backup Capt Steve with a comment as opposed to just a down vote? Oh, by the way, CaptSteve, why don’t you ask Mayor Landrieu’s son who was arrested for drunk driving and hit a car this past year, what he thinks? That may be but it’s just plain wrong to equate college students’ drinking with carjacking. Yes, there are too many resources as we see over and over in all kinds of ways devoted to pursuing lesser-violation transgressors (in the interest of making money for the law enforcement agenices?) and obviously not enough devoted to the serious crime (and they don’t make any money with that, either). Well if it’s plain wrong to equate a college student’s drinking to carjacking, why equate more money for schools, pre-school, and programs like Head Start to lowering crime i.e. carjacking? Based upon what you think is “wrong”, they should get rid of programs like “Head Start” as it not a direct correlation to carjacking, and hence will no lower crime. Carjackers, druggies and homeless don’t become these menaces and burdens to society overnight. It’s the step-by-step actions that you say are “not a problem to society” that really are long term problems. A neighborhood doesn’t become the “hood” overnight. It’s the step-by-step actions like the neighborhood bar that keep selling beers to the town drunk, who beats his wife and then gives birth to more kids who themselves more quickly become drunks and beats their wives and hence they all can’t hold a job. They themselves start a small “get together” with other drunk/addicts in the neighborhood and then a small gang forms. These then cause problems to the other businesses AND also scare away new businesses away, thus lesser and lesser jobs….. In the end, you end up with the poorest city in America that has no companies and likewise no jobs and a bunch of Public Relation Spin from the clueless leaders and talking heads. In other words, you end up with a city called New Orleans that is slowly decreasing in population, no matter what the local media and leaders as well as the census says. if the city was actually growing in population, why is the city budget and tax revenue less and less????? I’m familiar with the broken window theory. It applies to low income impoverished neighborhoods, not upscale college students. And if you know the guys family history so well, why haven’t you turned him in. or called his mom to get the dog back? The parents of these carjackers and others committing these violent crimes were once college students having a few beers at The Boot, were they? The idea that it’s worthwhile to have so many law enforcement resources devoted, as they are, to pursuing the low-effort-to-catch-and-make-money-from transgressors like the 18-20 year old college students referred to because doing so prevents those same people or their offspring from committing crimes like carjacking at some later point is ridiculous. The relationship being asserted to exist between college students’ partying and violent crime such as carjacking sounds like something that someone who doesn’t like the college students to begin with would like to believe but it still defies common sense (the students, because they are seen to have money, are more likely to be victims of some violent crime themselves than to perpetrate such a crime). I realize what the “Broken Window” theory is but if that’s what we want to address then the law enforcement resources (as well as other services that cost a fair amount and people seem not to like paying for, such as mental health treatment) would need to be devoted heavily with community policing and walking the beat in the poorer neighborhoods (and which isn’t where they can make money giving tickets, citations, etc.) and NOT where they seem to be devoting them now. Guess you know the “hot spots”….hum? Does the presence of NOPD disturb you?….hum! when does all this STOP….. please people this is ridiculous.. come on. It is sad, but people of New Orleans and especially Uptown, we need to be hyper vigilant and aware of our surroundings at all times. This city is a war zone. Don’t be a victim. what did the perp look like? Here’s a hint: the NOPD has a description….even better, the NOPD will share it because they want to catch the guy…..we need to know so we can stay safe by avoiding perps who match this description…..what is hard to understand about this?…..BTW, it’s totally disgusting that the perp took her dog…..
Screw all the finger pointing. This jackass needs to be found and tied to a tree at the dog park, upside down. Don’t even call the Cops in until he begs. It really pisses me off when you pay the highest property taxes in the State, the highest rate on sales tax in the state, the highest electricity , water bill in the nation with all the taxation you get *hit for your money: horrible streets, inept police and city services, 70% of the treated water leaking underground, poor schools, ect,ect,ect, why would anyone with any brains live here! I’m glad you live in Old Metairie, too. Those of us who actually live Uptown need to continue to be good neighbors and look out for one another. Be careful and stay safe. Check the usual suspects: Hickory & Leonidas; Apple & Eagle; Valence and Freret; Simon Bolivar and MLK; Annunciation and Amelia; etc. I live just down the street where this happened, I can assure you this young man would’ve had a different outcome had he came upon me. I have pepper spray, a taser and two guns, if everybody was not only vigilant and armed and ready, then maybe the criminals will start looting Old Metaire instead. Why shouldn’t the broken window theory apply to college students? Look at the Landrieu’s. Didn’t his son get drunk around the bars on Broadway and Maple and hit a car a few months ago? Couldn’t Landrieu’s son could have killed someone and that would have be worse than a carjacking? And speaking about COLLEGE kids, look at all the lawyers in criminal, civil and traffic court in Orleans Parish as well as all their relatives. Aren’t many corrupt and when they are drunk they spill the beans, or do something criminal. And what about Dutch Morial’s sons? See what happened there? Didn’t at least one of them go from drunk to high on drugs and a constant set of addictions as well as tax evasion…..Just like a few of stories of homeless in those impoverished neighborhoods? Or perhaps we can move to Jefferson Parish or St. Tammany Parish? Let’s see how many corrupt officials have been convicted for DUI? What about that mayor in Mandeville? Or the Lake Pontchartrain cops, or for that matter the NOPD cops who also drive drunk? If those of you with Law degrees keep NOLA going in the direction it’s been going for the last 50 years, one day it will be just you, the bars, and a bunch of broken windows. What does a stolen phone have to do with an incorrect phone number? What’s she talking about? According to the lady who was the victim in this stupid crime, she lost her Cell Phone when her car was stolen and that’s the same number as on her dog’s ID Tag. Thank God she didn’t have kids in the car too.